There was plenty of enthusiasm from Day One. There was excitement, eagerness, anticipation. But even for the greatest optimist inside Middleton’s boys soccer program, the Cardinals’ remarkable start has to come as a surprise. 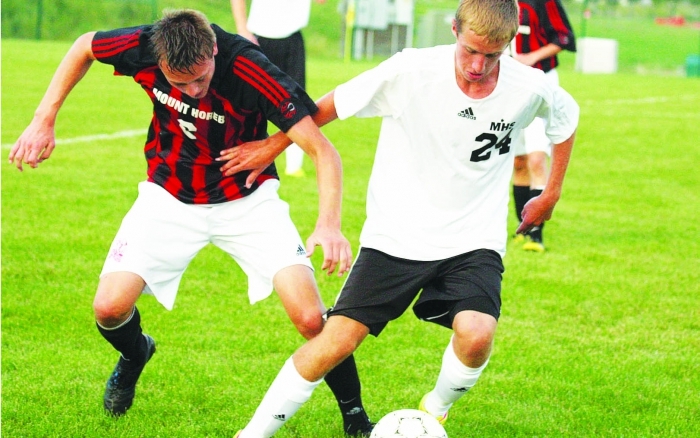 Middleton won two more Big Eight Conference games last week, rolling past Madison East, 4-2, last Tuesday and besting Madison La Follette, 5-0, last Thursday. The Cardinals improved to 8-0-1 on the season and 4-0 in the Big Eight Conference. After losing 15 seniors, no one inside the program knew exactly what to expect. How about a magnificent start that has the Cardinals ranked No. 2 in the latest Wisconsin Soccer Coaches Association poll. “We were optimistic coming into the season, but never expected to find success this quickly,” Middleton senior defender Jordan Grapentine said. “We lost a ton of seniors. Replacing that many players is never easy. Cardinals senior defender Roger Waleffe agreed. Last week was a continuation to Middleton’s sensational start. The Cardinals jumped out to a 2-0 lead against the Purgolders when Nick Bilodeau scored in the second minute and Braden Allen had a goal in the 34th minute. East responded with goals in the 48th and 59th minute, and to the surprise of many, tied the game, 2-2. But Allen scored again in the 65th minute and Ivan Khamenka scored in the 83rd minute as the Cardinals survived. “Our East game was tougher than it should have been,” Middleton coach Ben Kollasch said. “East is a scrappy team that is always looking to overachieve and we let them hang around well into the second half. Middleton responded with an impressive performance against the Lancers, scoring four second half goals and cruising to the win. Allen scored on a penalty kick in the 14th minute to give Middleton a 1-0 edge. It stayed that way until the 57th minute when Bilodeau scored on an assist from senior midfielder Devin Ott to make it 2-0. Allen’s goal in the 62nd minute made it 3-0. Then Noah Steiner and Khamenka scored before things ended. Middleton’s fast start has vaulted it from a team flying under the radar to one that’s now firmly in the spotlight. Milwaukee Marquette tops the state ranking, but the Cardinals have been on a steady rise and jumped to No. 2 this week. To date, Middleton’s players seem to be handling the extra attention with aplomb. Grapentine agreed with his teammate. “Yeah I'm not going to lie, we were all pretty excited when we saw ourselves in the state rankings,” Grapentine said. “It's always nice to receive recognition for hard work. There have three major keys to the Cardinals’ sensational start. One, Middleton’s offense has been more explosive than any time in recent memory. The Cardinals have 43 goals in their first nine games (4.8 average). Two, the newcomers have stepped in and contributed from the start. That group has been fueled by a gifted sophomore class that includes Allen, Brendon Martin, Ryan Peyton and Christopher Geanon. And third, Middleton’s bench is extremely deep, which has helped the Cardinals wear down their foes. “This year I can say that I could put any player on my roster into the game and have confidence that they can excel and thrive at the varsity level,” Kollasch said. “Senior to sophomore they are ready to play in pressure situations and many of them can fill in at multiple positions at that level. That creates a great atmosphere of competition around the team. That’s certainly the goal for these Cardinals. But everyone knows it won’t be easy. Big Eight foes Madison West and Madison Memorial are ranked No. 3 and 4, respectively, in the latest state poll. And both teams are in Middleton’s sectional. The rest of the schedule is lined with challenges. But Middleton certainly seems ready to handle each and every obstacle. And right now, that team is the surprise of the state. • On deck: Middleton is at Sun Prairie Tuesday at 7 p.m. The Cardinals travel to Madison Memorial Thursday at 7 p.m. for a conference showdown, then are at the Muskego Invitational Friday and Saturday. Honorable mention: Beloit Memorial, Menomonee Falls, Eau Claire Memorial, Kettle Moraine.